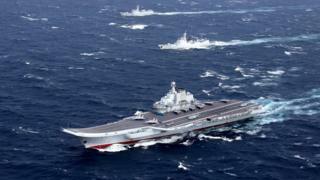 China's only aircraft carrier has led several warships across the Taiwan Strait, Taiwan's defence ministry said. In response, Taiwan's military monitored the flotilla of Chinese ships as it passed through the 160km-wide (100-mile) strait, Taiwan's defence ministry said. China considers self-governing Taiwan part of its territory, to be reunited with the mainland by force if necessary. Tensions have been high since US President-elect Donald Trump broke with long-standing diplomatic protocol and took a congratulatory phone call from Taiwan's President Tsai Ing-wen. The head of Taiwan's Mainland Affairs Council, Chang Hsiao-Yueh, said the authorities were monitoring China's actions and appealed for calm. "I want to emphasise that our government has sufficient capability to protect our national security. It is not necessary to overly panic. On the other hand, any threats would not benefit cross-strait ties at all. Together we should show mutual good will." China has increased military drills near Taiwan, and spoken of "increased levels of uncertainty" in relations with the island. A diplomatic row was again kicked off when Ms Tsai visited the US at the weekend in transit to Central America and met officials, despite protests from Beijing.